Abrasive wear of industrial materials handling plant (e.g. transfer chutes, conveyors and hoppers) is a direct cause of repair, replacement and downtime and represents a major factor in the cost of production. Abrasive wear is also an important factor in determining the life of tillage and construction equipment and in the case of tillage tools has a direct impact on the draft forces required to pull the plough. There is therefore considerable interest in the design, development and use of cost effective wear resistant materials for such applications. The wear resistance of a material cannot be predicted reliably from simple properties such as bulk hardness, elastic modulus or tensile strength. There is therefore a need for a reliable and convenient approach to the study of abrasive wear properties. 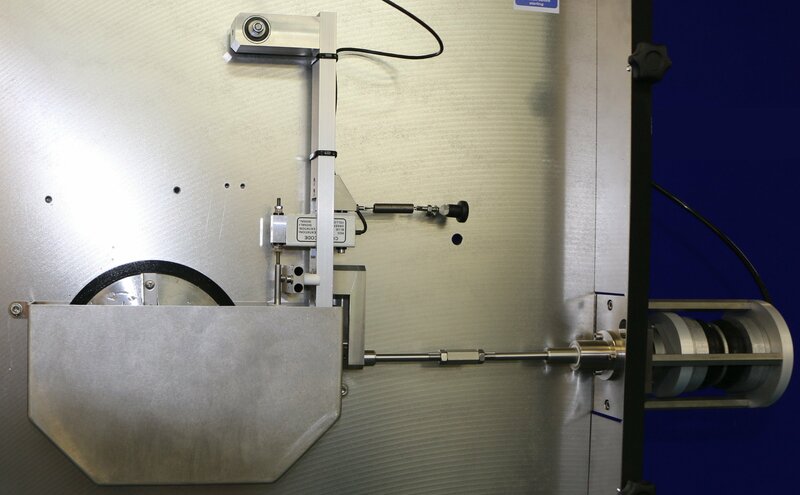 A number of standard methods have been developed with the aim of producing test data that will reproducibly rank materials under a specified set of conditions. The most widely used are the sand/rubber wheel test in dry (ASTM G 65) and wet (ASTM G 105) conditions and a sand/steel wheel test in wet conditions (ASTM B 611). 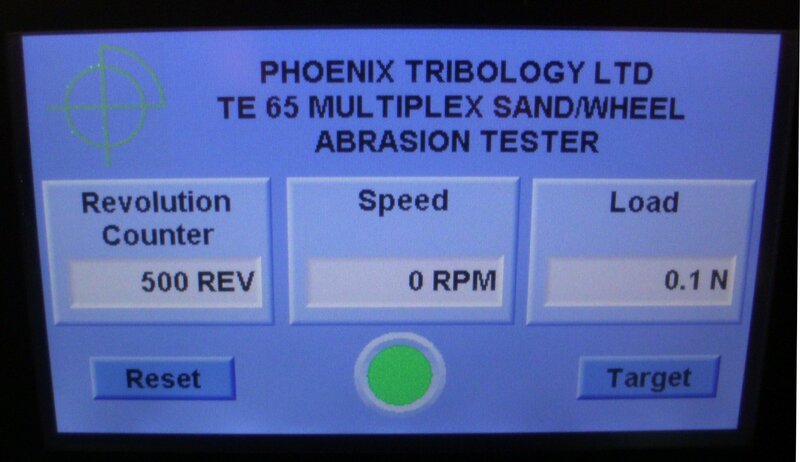 These define tests under dry or slurry conditions with specified loads, wheel speeds and sand feed rate. In all cases the abrasive used is rounded quartz grain sand. It is clear, therefore, that a single set of test conditions will not be sufficient for determining the wear resistance of diverse materials. One of the main features of the machine described in the ASTM G 65 method is the nozzle: this is critical to determining the mass flow rate of sand and the number of particles in the contact. However it is restricted to one type of sand and there are no facilities for adjusting the mass flow over a wide range. The consumption of sand is also high due to the large mass flow required. Lower flow rates are desirable if non-standard abradants are to be used, thus requiring smaller batches to be produced. The particle loading is a very crucial parameter for a given abradant as this controls whether the particle cuts or is crushed in the contact. Particle loading may be controlled over a wide range by adjusting the mass flow and the normal load on the test block. The ASTM test pieces are relatively large and therefore expensive to prepare out of typical hard surfacing materials. It would be preferable to be able to run with smaller samples or even to run multiple tests on one sample, thus reducing the cost per test. The wet rubber and steel wheel tests use a large volume of slurry containing 1.5 kg of sand that is agitated by paddles on the wheel as it rotates. Smaller quantities are desirable if non-standard abradants are to be used. The machine is floor standing with test assemblies mounted on a back-plate and abradant discharged downwards into a hopper. Load is applied by pneumatic bellows with a force transducer for load measurement. Both manually controlled and servo controlled pneumatic loading are available. 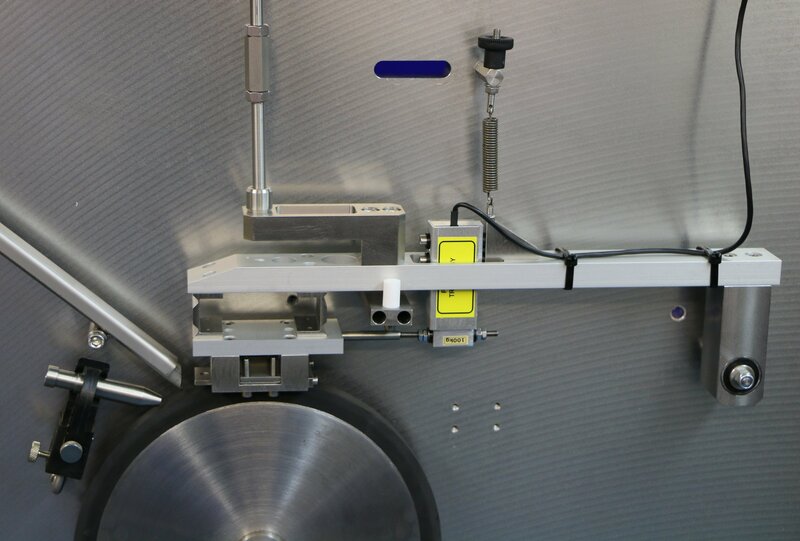 The specimen arm may also include a strain gauge transducer to measure the dynamic friction. 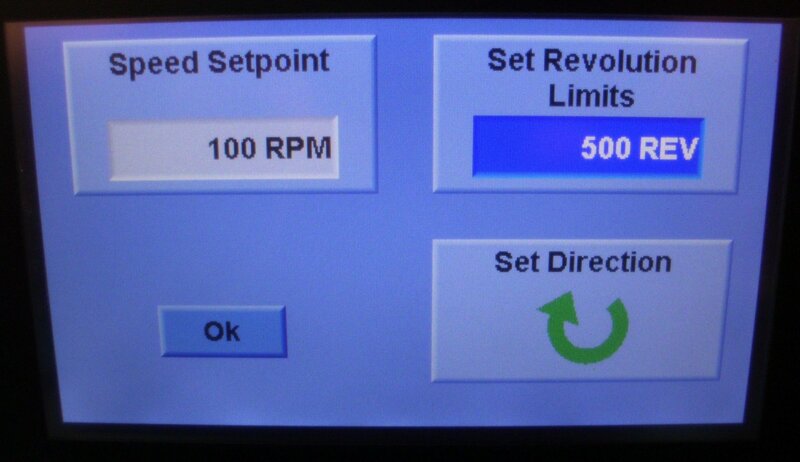 A touch–screen digital controller provides the user interface. 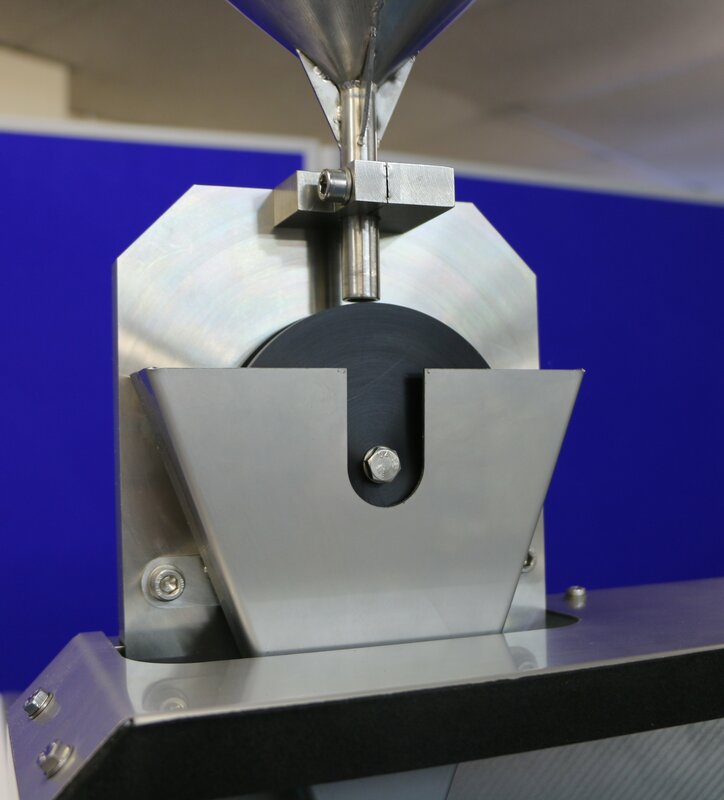 ASTM G 65 uses hopper fed sand through a defined nozzle and loads the test piece sideways on to the wheel. The other standards have a fluid trough and the slurry is agitated by the wheel rotation. ASTM B 611 uses a steel wheel, thus providing higher stress abrasion than the rubber wheel tests. 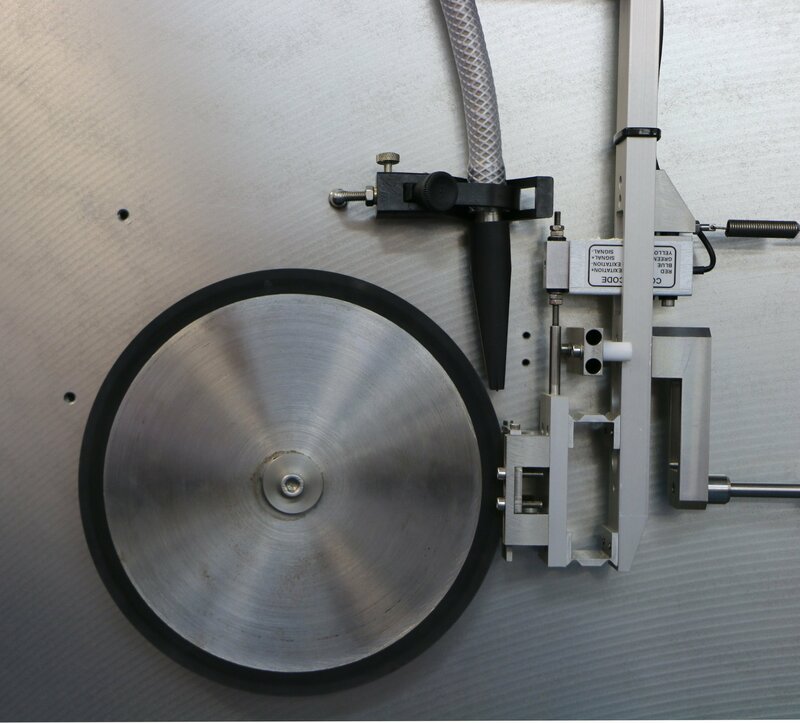 The TE 65 includes the option of a second loading position that presses the specimen on to the top of the wheel, with the specimen horizontal. 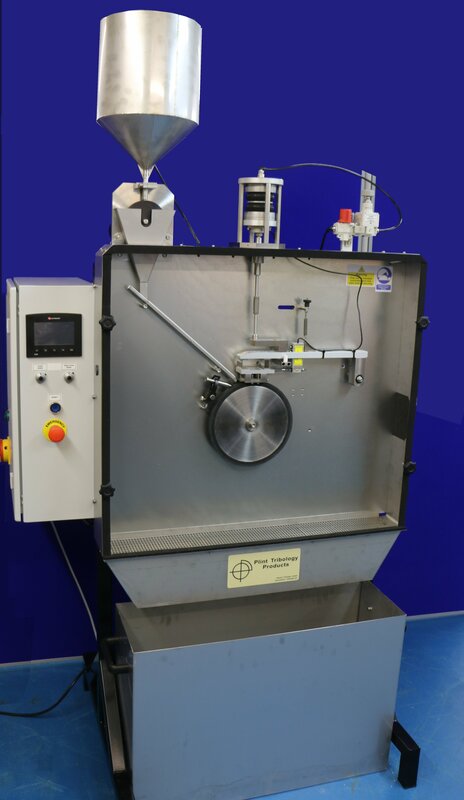 The alternative abradant feed system is designed to give a range of constant feed rates and produce an even monolayer of particles on the wheel in front of the contact. The abradant is fed from a hopper to a rotating drum with a shallow groove on its surface. 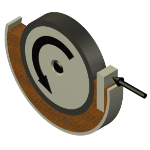 The feed rate is varied by adjusting the speed of the slotted drum. 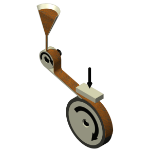 The out-fall from the drum is then guided to the wheel surface down a simple chute and this produces the monolayer on the wheel surface. Any abradant that does not pass through the contact may be collected separately and therefore the quantity of abradant actually passing the test block may be determined. This is not possible in the ASTM configuration. 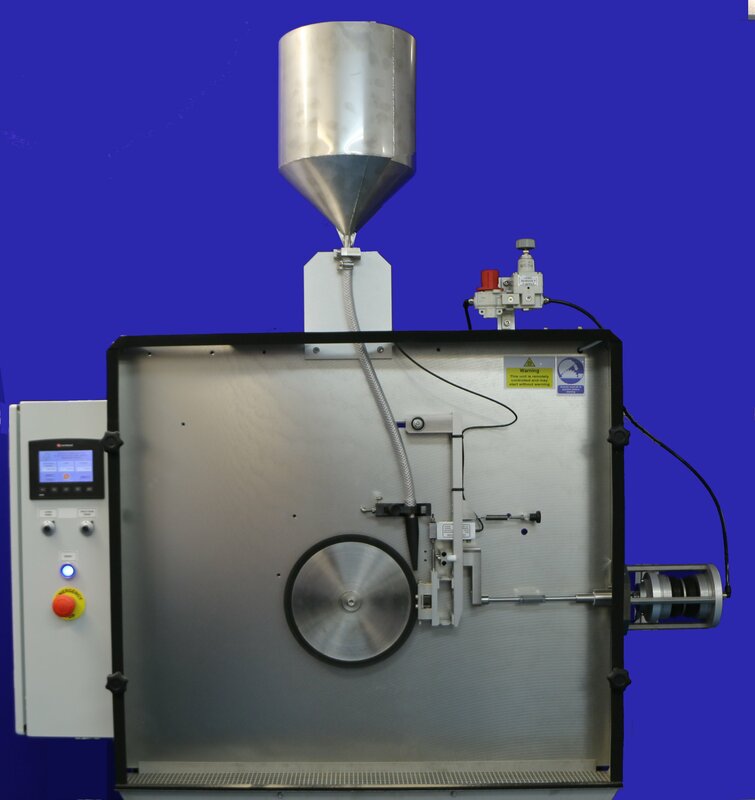 By having control of the drum speed, much lower abradant mass flow rates can be achieved than in the ASTM G 65 method. For wet tests, water is introduced on to the wheel surface, just behind the chute. This means that fully wet tests can be carried out, with the mass flow of abradant still controlled. This is not possible in the ASTM configuration. With variable speed drive motor and manually controlled pneumatic loading with precision regulator, force transducer and digital display. Vertical loading for ASTM G65, G105, B611 test assemblies. Hopper fed system for ASTM G65. Excluding precision abradant feed system and peristaltic pump for alternative horizontal loading configuration. Test rollers not included. With variable speed drive motor and manually controlled pneumatic loading with precision regulator, force transducer and digital display. Vertical loading for ASTM G65, G105, B611 test assemblies. Hopper fed system for ASTM G65. Including precision abradant feed system and peristaltic pump for alternative horizontal loading configuration. Test rollers not included. For use with TE 65MB or MA. To provide analogue voltage friction force signal for data logger or chart recorder input. Including power supply and strain gauge amplifier. Data logger/chart recorder not included. With variable speed drive motor, servo controlled pneumatic loading with force transducer feedback, friction force transducer, displacement transducer. Vertical loading for ASTM G65, G105, B611 test assemblies. Hopper fed system for ASTM G65. Precision abradant feed system and peristaltic pump for alternative horizontal loading configuration. COMPEND 2000 control and data acquisition system. Test rollers not included. PC included. Paper # 265 Critically Evaluated Abrasion Wear Tests on WC/Co Hardmetals. World Tribology Conference, London, September 1997. Paper # 269 Mechanisms of Wear in the High Stress Abrasion of WC/Co Hardmetals. Proceedings of PM 99, Turin. Paper # 271 Tungsten Carbide for Abrasion Resistant Applications, Using Powder Metallurgy in Design. Wear, Corrosion and Fatigue Resistance, Professional Engineering Publishers, April 2000, p 41-59. Paper # 274 Wear of Tungsten Carbide-Cobalt Hardmetals and Hot Isostatically Pressed High Speed Steels under dry Abrasive Conditions. Paper # 289 Development of the Dry Sand/Rubber Wheel Abrasion Test. 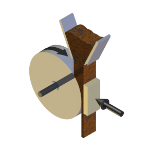 Paper # 313 An NPL Rotating Wheel Abrasion Test. NPL Measurement Note CMMT(MN)30, November 1998. Paper # 314 Characterisation of Baseline Hardmetals Using Property Maps. NPL Report CMMT(A)172, April 1999. Paper # 315 Abrasion and Reciprocating Wear Testing of Ceramics and Hardmetals. NPL Report CMMT(A)166, May 1999. Paper # 318 Rotating Wheel Abrasion Tests on Hardmetals and Ceramics. NPL Measurement Note CMMT(MN)46, May 1999. Paper # 322 Procedure for Rotating Wheel Abrasion Testing. NPL Report MATC(A)54, July 2001.